I have been told that place used to be something else. It used to have a function, a structure, a social background. Once you were in there, a certain norm of behavior had to be respected. It used to have a door to be closed, or a door to be opened. It used to impose order, maintain silence and demand light. That place used to mark the street; it used to be a destination, a point of meeting, or a point of departure. That place used to be part of a human’s life; a dark spot in someone´s personal history; or an inevitable station in someone´s journey. And then this place stopped “to be”, and started “to become”. The place lost its function, its structure disrupted, the background vanished. There was no one to adjust its behavior to this place; no one for switching lights, no one for pulling down the window blinds. Even the silence sounded differently. It was no one´s destination, neither point for meeting nor for departure. As a place with an outdated function and rundown structure, it became only an endless possibility. It allowed for an “in-between” spatial use. 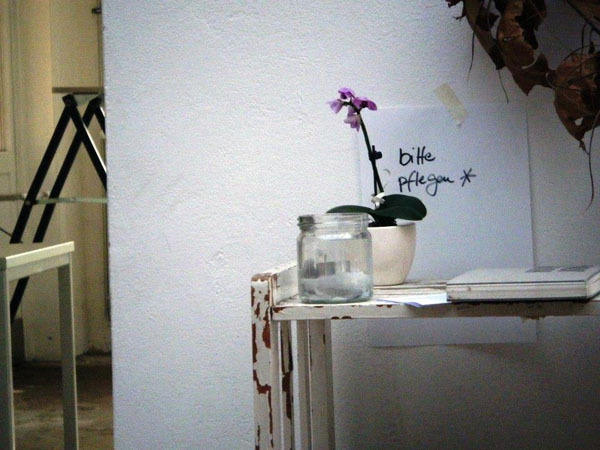 Suddenly without a meaning, it opened a door for reinterpretation, reuse, re-adaptation and social replay. It became UdN—the way I got to know it. The first questions I asked when I entered this liminal and “soon-to-be place” were: “What is this place? A dormitory? A squat? A club? A cantina?” I understood after some time spent there that it is all that together, and nothing from that specifically. It is a non-place and an über-place; physically vacant and spiritually replete with meaning. It is extremely uncomfortable, as it is cold and modestly arranged, but surprisingly pleasant to spend your time in. There you can eat, think, talk, sleep. You can come inside, or stay outside—whatever, no borders to cross over. This place needs no improvement or cleaning. It only needs to be nurtured. During our presence in the UdN we engaged in stimulating discussions with other international and German students sharing manifold perspectives and knowledge from different backgrounds. 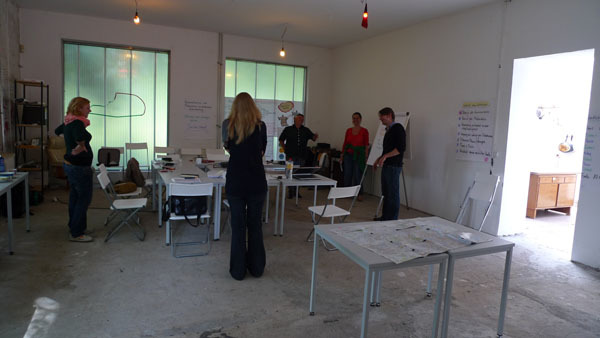 This “collective space” forms the heart of the UdN as meeting place for intercultural encounters and long discussions. It is always a surprise moment to see who is entering the front door and suddenly appears in the collective space. For us UM participants, this cultural melting pot – which included locals – allowed a deeper engagement with and understanding of the different activities of the HafenCity University Hamburg. In this sense, the UdN is creating a warm and welcoming environment for the gathering of guests from abroad and other parts of Germany, as well as Hamburgers. 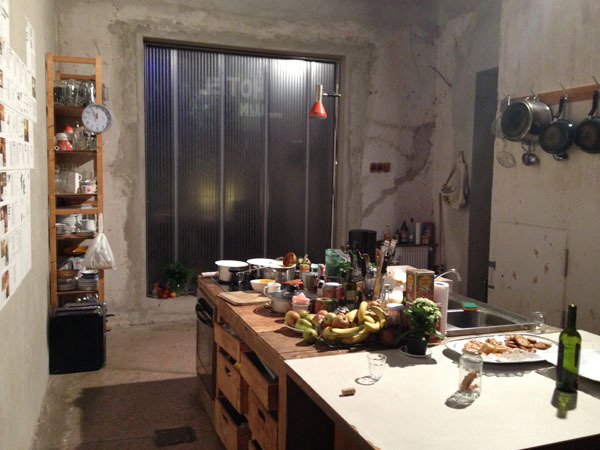 In a shared appropriation of all people involved the collective activities lived up rather intimate get-togethers such as pro-active cooking experiences and communal dinners. In the “soup kitchen programme” held at the UdN this socializing experience also involved the residents of the neighbourhood. In a tour guided by an official IBA-Expert we discovered changes and new developments in Wilhelmsburg. At the same time, staying at the UdN for some days made us realise the differences between the daily life of inhabitants in Wilhelmsburg and the planned urban IBA future. The heart of the research workshops carried out at the UdN is the interdisciplinary discourse of professors, assistants and doctorates along the lines of our shared research theme “Urban Metamorphoses”. In Panel discussions with relevant sub topics, all doctorates entered the discussion with a presentation of their own specific research. Especially though the contribution of international and comparative case studies by the doctoral candidates, the workshops developed into emancipated, inspiring and highly productive debates. The rather informal atmosphere of the UdN helped us to dive into the topics quickly and it was a special and stimulating environment to work in. 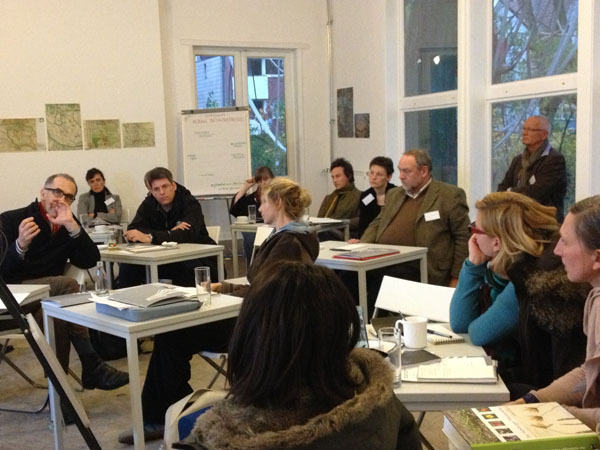 In November 2012 Urban Metamorphoses organized an internal symposium with the objective to contribute to a better understanding of the notion of metamorphoses in a transdisciplinary debate. Subsequently, it attempted to further develop potential research approaches to elaborate on the driving forces of the complex discontinuities of urban change. Invited speakers from four different disciplines provided the ground for opening the discussions on urban metamorphoses. Each presentation revealed its specific view on metamorphoses and contributed to the reflection of urban metamorphoses as a general topic of our discussions. 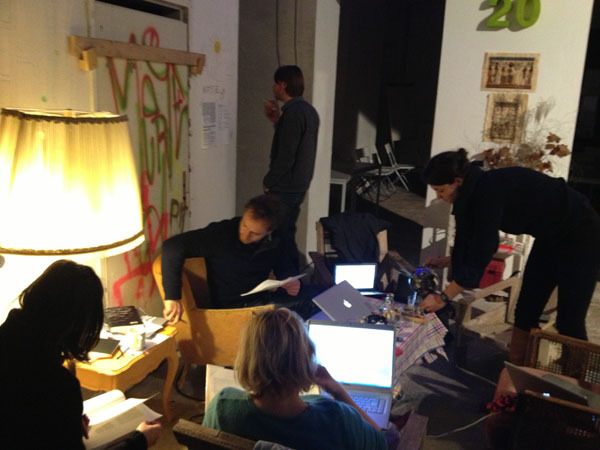 Transferring the inputs into the overall discussion about “Urban Metamorphoses”, the symposium participants followed specific aspects of metamorphoses, such as space and form, methods and “transdisciplinary methods”, concept and terminology as well as dynamic and process. 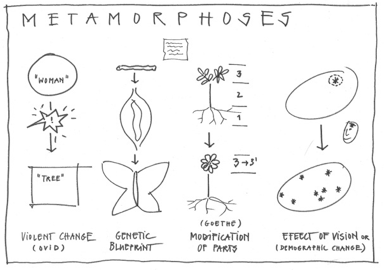 With a vast variety of different disciplinary meaning and aspects of the term “metamorphoses” the discussions helped to develop a broader understanding outside of our own disciplines. At the same time, it illuminated the importance of engaging with and better understanding the discontinuities and complexities of urban change from all possible perspectives. In summer we especially enjoyed the outside space of UdN. 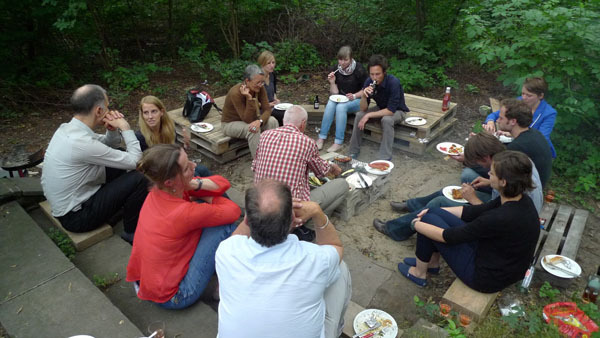 While having a barbeque and beer we got a nice informal space to meet with our supervisors. Each one of us brought a typical dish from his/her home country or the country of their field study, which resulted in a table full of delicious meals and opportunities for exchange. Lastly, the UdN itself is intrinsically entangled with the research on “Urban Metamorphoses”. By a transdisciplinary approach it seeks to overcome the monodisciplinary and normative models of the city that reflect first and foremost on the outcomes of urban change. The research on urban metamorphoses is the attempt to point at the dynamic genesis and Wirkungsgeschichte of urban spaces as well as its mutual and “design-active” interactions, of which the UdN is a part of.